Background/Purpose: Polymyalgia rheumatica (PMR) is a common inflammatory disease of the elderly. In the absence of a diagnostic test its differential diagnosis which is mainly based on clinical expertise, elevation of C-reactive protein and exclusion of other diseases can be challenging. Extracapsular inflammation in the pelvic and the shoulder girdle has recently been highlighted by studies using FDG-PET/CT and MRI. Based on our observations in the last years we have developed a scoring system for pelvic girdle MRI scans concentrating on characteristic findings in PMR and, thus, evaluated its use as a diagnostic test. Methods: A total of 120 pelvic contrast enhanced MRI scans of patients with pelvic girdle pain was available. While 40 patients had PMR diagnosed by an expert rheumatologist, 80 were found to have other inflammatory or non-inflammatory causes of pain. Three radiologists fully blinded to the clinical diagnosis scored peritendinous contrast enhancement at 19 predefined sites: 9 tendinous sites bilaterally and the most caudal perispinous area of the lumbar spine. Five different patterns of involvement were evaluated. Inter- and intraobserver agreements were assessed by intraclass correlation coefficients (ICC). Results: There were 55% and 62.5% females in the PMR and the control group, respectively. Their mean age was 64.2±8.8 years, with no difference between groups. The interobserver ICC with 0.76 and the intraobserver ICC with 0.88-0.91 for the assessment of single sites were excellent. In the PMR group, 13.4±2.7 sites were affected, but only 4±2.3 in controls. Mostly bilateral peritendinitis at the proximal M. rectus femoris and the origins of M. adductor longus were the hallmark of pelvic involvement in PMR (Figure). A bilateral affection of these two sites discriminated patients with PMR from controls with a sensitivity of 100% and a specificity of 95%. If at least 4 sites including one of those two were bilaterally affected the specificity even improved to 97.5% without reducing sensitivity, this pattern performed best. Conclusion: The MRI findings described here were found to be very characteristic and even specific for PMR. Thus, we think that contrast enhanced pelvic MRI is a valid imaging tool for diagnosing PMR. These results need to be confirmed in larger prospective studies. Figure. Illustration of extracapsular inflammation in 19 predifined sites in PMR (left) and controls (right) superimposed on X-ray. The upper semicircle represents colour encoded relative frequency at individual site, the lower semicircle colour encoded and numeric frequency of bilateral affection. Disclosure: M. Fruth, None; J. Kozik, None; P. Martin-Seidel, None; A. Seggewiss, None; B. Buehring, None; X. Baraliakos, None; J. Braun, None. Fruth M, Kozik J, Martin-Seidel P, Seggewiss A, Buehring B, Baraliakos X, Braun J. Inflammatory Findings Detected By MRI at Entheseal Sites in the Pelvic Girdle of Patients with Polymyalgia Rheumatica Have Potential for a Diagnostic Test [abstract]. Arthritis Rheumatol. 2018; 70 (suppl 10). 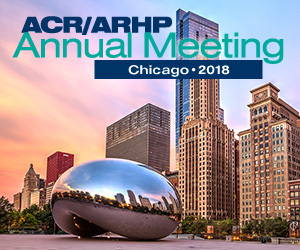 https://acrabstracts.org/abstract/inflammatory-findings-detected-by-mri-at-entheseal-sites-in-the-pelvic-girdle-of-patients-with-polymyalgia-rheumatica-have-potential-for-a-diagnostic-test/. Accessed April 20, 2019.